NAHP (March 24, 2016) Comcast expands its program “Internet Essentials” with a special announcement on March 24 from Miami, Florida. The program is now available for families who are residents of public housing in Miami, Nashville, Philadelphia and Seattle. 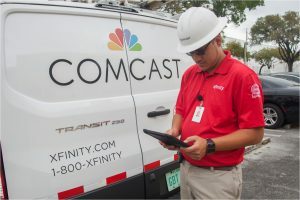 The announcement was made today by David Cohen, Comcast Executive Vice President together with the Secretary of Housing and Urban Development, Julian Castro. This program provides internet access with speeds up to 10 Mbps for only $9.95 per month. The package includes a wireless device inside the house, free internet access for training, and the option of purchasing a computer for less than $150. “The program started 5 years ago at the national level in many cities where Comcast service is available” Cohen said for the National Association of Hispanic Publications later in the day after the announcement. The program was originally designed to give access to hundreds of thousands of families with children who are enrolled in the special program of free school meals. He also announced that nationally, 2.4 million people or 600,000 low-income families have benefited from this program since its inception. “With the expansion of this program today, anyone living in public housing will qualify for the Internet Essentials, regardless of whether or not children live in the residence,” said David Cohen. About 18% of low-income households with incomes at or less than $ 14,000 in public housing has fixed internet access, compared to households with incomes of $ 100,000 or more where 90% have fixed internet access. “This program is the bridge to cross the digital divide, and will help many to climb the economic ladder providing opportunities in education, employment and more,” Cohen explained in his corporate blog. “The purpose is to reach as many people through the public housing authorities, community organizations and their leaders, local government agencies, to the residents themselves and close the digital divide one house hold at a time”, Cohen explained in his corporate blog. “For these four cities, the impact of access is about 40 thousand homes, and the resident will not incur an installation cost”, Cohen added. The purpose is to reach as many people through the public housing authorities, community organizations and their leaders, local government agencies, to the residents themselves and close the digital divide one house hold at a time. There is a phone number exclusively set for Spanish-speaking communities where questions can be answered directly by the resident at 1-855-765-6995. There is also a general number for Internet Essentials available to all in the communities for questions by calling 1-855-846-8376.